The photo was taken from the east looking west across the Grand River. 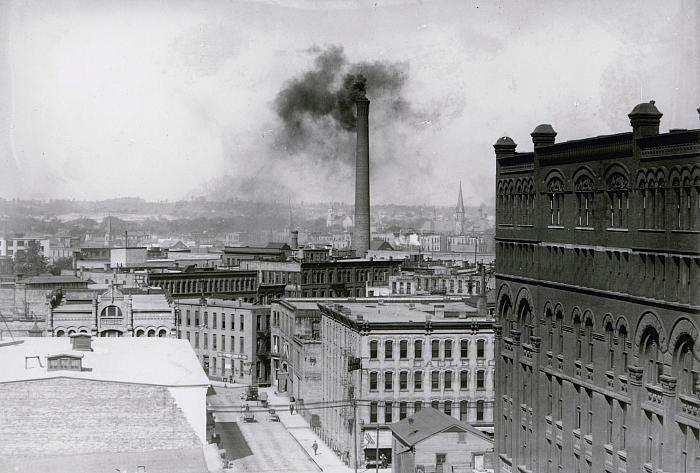 The 265 ft. smokestack belonged to the Raniville Power Building located on Campau between Pearl St. and Lyon St. The dark building with arched windows in the right foreground is the Blodgett Building at the NW corner of Louis and Ottawa. The Eagle Hotel is the light colored building located in front of the smokestack, and it stood at the NW corner of Market and Louis. The church steeple just visible between the smokestack and the Herpolsheimer building appears to be St. Mary's Catholic Church at the corner of First and Turner. Title by cataloger. The Blodgett Building eventually became part of the Herpolsheimer Department Store located at the SW corner of Monroe and Ottawa.